There are so few living legends still alive today when it comes to the world of baseball. And when it comes to baseball from the 1970s, there are a few names that probably leap to mind. 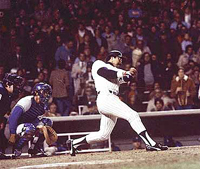 And if one were to ask a fan which baseball legend truly defined the entire decade, well, then there is probably only one name that really comes to mind: Reggie Jackson. The man who would become known as “Mr. October” for his consistent and exciting performances in the post-season for the Yankees, is still active amongst the Yankees coaching and managing staff. These days, the best place to see Reggie Jackson is in Spring Training with the Yankees. Yes, the man who brought so much glory to the Yankees during the 70s is still around and still helping his team but during the Spring Training season. He is there, coaching his team, helping the young players, and trying to help prepare the team for the regular season, in hopes that they can make it into the post-season. Reggie Jackson spent years playing for a number of teams before he came to the New York Yankees and would eventually earn his nickname. He was well-respected from the very start. He was known for his ability to intimidate pitchers and pound the ball out of the park or over the outfield fence. It was during the 1970s, however, when the city of New York really needed something positive to cling to, that things got interesting and his fame during the post-season really grew. When Jackson joined the Yankees, in 1977, it was hardly the team that would become the stuff of legend down the road. He immediately conflicted with manager Billy Martin. Of course, Martin was known throughout baseball for being difficult. Things came to a head in June of that year when the Yankees faced off against the Boston Red Sox and Jackson and Martin got into a physical confrontation in the dugout in a fight that was broadcast all across the country. The Yankees would face off against the Los Angeles Dodgers that year in the World Series, despite those difficulties. Jackson would earn his nickname that series when another player referred to him as Mr. October because of his past performances in the World Series with Oakland and other teams. During games four and five of that series he would hit homers. Then came Game 6 and things took legendary proportions. Jackson would end up hitting three consecutive home runs. Each time he hit the ball out of the park he did so on the very first pitch he faced. He also managed to do it off of three separate Dodgers’ pitchers. The first one came off of pitcher Burt Hooton, the second would come off of pitcher Elias Sosa, the third came off of Charlie Hough. Hough was a notorious knuckleball thrower, which meant his ball was much slower, meaning that the fact Jackson hit the ball such a distance was amazing. These days, Reggie Jackson can often still be found donning a Yankees uniform. This is particularly for those fans who follow the team during Spring Training. He coaches the team during that part of the season, and often shows up for team events. He routinely throws out ceremonial pitches for the team, and has appeared in more parades to help the team celebrate outstanding post-season performances. He also still has a tendency to be controversial. For example, in 2012 he made some comments about key Yankees players, such as Alex Rodriguez, and it got him banned from the team clubhouse for a time. This season, however, it is hoped that bygones will be bygones and he will return to help the team prepare for the new season. So, Mr. October is still around and still doing what he can to help the team for which he is best known. How that helps shape the team for 2013 remains to be seen.